Year April 23 is the 113th day of the year (114th in leap years) in the Gregorian calendar. There are 252 days remaining until the end of the year. International Pixel-Stained Technopeasant Day is a commemoration declared by author Jo Walton, held on April 23 and first celebrated in 2007, in response to remarks made by Howard V. Hendrix stating that he was opposed “to the increasing presence in our organization the Science Fiction and Fantasy Writers of America of webscabs, who post their creations on the net for free.” The purpose of the day, according to Walton was to encourage writers to post “professional quality” works for free on the internet. The name of the day originates from the assertion by Hendrix that the “webscabs” are “converting the noble calling of Writer into the life of Pixel-stained Technopeasant Wretch.” The word “webscabs” is derived from “scabs”, a derogatory term for strikebreakers. UN English Language Day is observed annually on April 23. The event was established by the UNESCO (United Nations Educational, Scientific and Cultural Organization) in 2010 to seeking “to celebrate multilingualism and cultural diversity as well as to promote equal use of all six of its official working languages throughout the organization.” April 23 was chosen as the date for the English language because it is the anniversary of William Shakespeare’s birth. Canada Book Day is a yearly event celebrated in Canada on April 23 to promote reading and books during Canada Book Week. Canada Book Day is celebrated on the same day as World Book and Copyright Day, a yearly event organized by UNESCO to promote reading, publishing and the protection of intellectual property through copyright. Canada Book Day was organized by the Writers’ Trust of Canada, a national organization whose mandate is to represent writers and support Canadian English-language literature. The Trust no longer organizes this event. World Book Day or World Book and Copyright Day (also known as International Day of the Book or World Book Days) is a yearly event on April 23, organized by the United Nations Educational, Scientific and Cultural Organization (UNESCO), to promote reading, publishing and copyright. In the United Kingdom, the day is recognized on the first Thursday in March. World Book Day was celebrated for the first time on April 23, 1995. The connection between April 23 and books was first made in 1923 by booksellers in Catalonia, Spain. The original idea was of the Valencian writer Vicente Clavel Andrés as a way to honor the author Miguel de Cervantes who died on this date in 1616. In 1995 UNESCO decided that the World Book and Copyright Day would be celebrated on April 23, as the date is also the anniversary of the death of William Shakespeare and Inca Garcilaso de la Vega—both also died in 1616—as well as that of the birth or death of several other prominent authors. In Spain, to celebrate this day, Cervantes’s Don Quixote is read during a two-day “readathon” and the Miguel de Cervantes Prize is presented by the Spanish king in Alcalá de Henares. In Catalonia, Spain, St. George’s Day has been “The Day of the Rose” since 1436, and involves the exchange of gifts between loved ones and respected people—it is analogous to Valentine’s Day. Although World Book and Copyright Day has been celebrated since 1995 internationally, books were exchanged on “The Day of the Rose” in Catalonia since 1929, in memory of Cervantes. In Sweden, the day is known as Världsbokdagen (“World Book Day”) and the copyright aspect is seldom mentioned. Normally celebrated on April 12, it was moved to April 13 in the year 2000 and 2011 to avoid a clash with Easter. In the United Kingdom, World Book Day is held annually on the first Thursday in March, as April 23 clashes with Easter school holidays; April 23 is also the National Saint’s Day of England, St. George’s Day. Conversely, a separate event World Book Night organized by independent charity The Reading Agency is held on April 23. In Kensington, Maryland, United States the International Day of the Book is celebrated with a street festival on the Sunday closest to April 26. 1016 Edmund Ironside succeeded his father Æthelred the Unready as king of England. 1516 The Bayerische Reinheitsgebot was signed in Ingolstadt, Bavaria, Germany. The Reinheitsgebot (German pronunciation: /ˈʁaɪnhaɪtsɡəboːt/), sometimes called the “German Beer Purity Law” in English, is the collective name for a series of regulations limiting the ingredients in beer in Germany and its predecessor states. The most well-known version of the law was adopted in Bavaria in 1516, but similar regulations predate the Bavarian order, and modern regulations also significantly differ from the 1516 Bavarian version. The most influential predecessor of the modern Reinheitsgebot was a law first adopted in the duchy of Munich in 1487. After Bavaria was reunited, the Munich law was adopted across the entirety of Bavaria on April 23, 1516. As Germany unified, Bavaria pushed for adoption of this law on a national basis. According to the 1516 Bavarian law, the only ingredients that could be used in the production of beer were water, barley and hops. The 1516 Bavarian law set the price of beer (depending on the time of year and type of beer), limited the profits made by innkeepers, and made confiscation the penalty for making impure beer. Furthermore, we wish to emphasize that in future in all cities, markets and in the country, the only ingredients used for the brewing of beer must be Barley, Hops and Water. Whosoever knowingly disregards or transgresses upon this ordinance, shall be punished by the Court authorities’ confiscating such barrels of beer, without fail. Boris Fyodorovich Godunov /bɐˈrʲis ɡədʊˈnof/ (Бори́с Фёдорович Годуно́в in Russian) ruled the de facto regent of the Tsardom of Russia from about 1585 to 1598 and then as Tsar of All Russia from February 21, 1598 to 1605. Boris was born around 1551 to Feodor Ivanovich Godunov “Krivoy“ (“the one-eyed”) and his wife Stepanida Ivanovna. The Godunovs were members of an ancient, now extinct, Russian family of Tatar origin, descended from the Tatar Prince Chet, which came from the Golden Horde to Kostroma in the 1300s. Godunov’s career began at the court of Ivan IV, also known as “Ivan the Terrible”. In 1571 he became an oprichnik, a member of Ivan’s personal guard and secret police. To strengthen his position at the court, he married Maria Grigorievna Skuratova-Belskaya, the daughter of oprichniks’ head. In 1580, the Tsar chose Irina Godunova, Godunov’s sister, to be the wife of his second son and eventual heir, the fourteen-year-old Feodor Ivanovich. On this occasion, Godunov was promoted to the rank of Boyar, the highest rank, second only to the tsar. On his deathbed in 1484, Ivan IV appointed a council consisting of Godunov and others to guide his feeble-minded son and successor, Feodor Ivanovich. 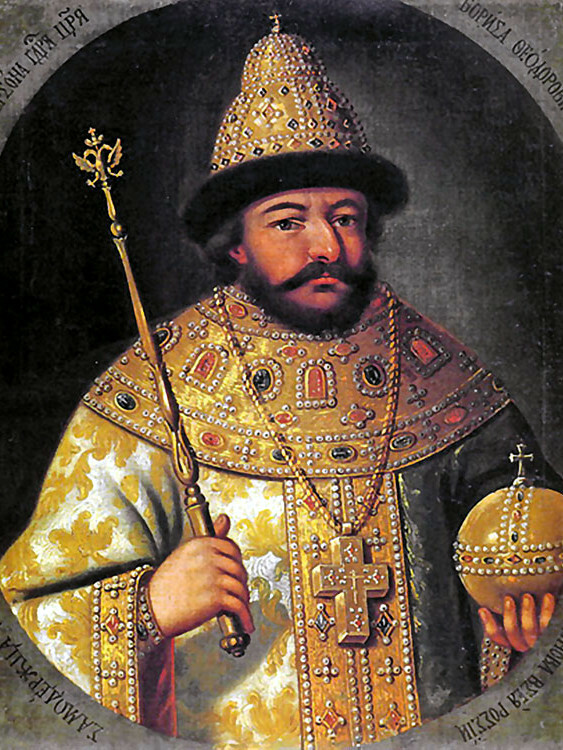 At Feodor’s coronation as Tsar Feodor I on May 31, 1584, Boris became a member of the regency council, second in command behind Feodor’s uncle Nikita Romanovich. When Nikita died in 1586, Boris had no serious rivals to become regent, the de facto ruler of Russia. Godunov’s policies were generally peaceful and always prudent. In 1595, he recovered some towns lost to Sweden under Ivan’s reign. He supported an anti-Turkish faction in the Crimea and subsidized the emperor in his war against the sultan. Godunov encouraged English merchants to trade with Russia by exempting them from duties. He built towns and fortresses along the north-eastern and south-eastern borders of Russia to keep the Tatar and Finnic tribes in order. He colonized Siberia with scores of new settlements. In 1597, Godunov’s most important domestic reform forbade peasants from transferring from one landowner to another, which they were free to do around Yuri’s Day (the Russian name for either of the two feasts of Saint George celebrated by the Russian Orthodox Church), thus binding them to the land. This ordinance aimed to secure revenue, but it led to the institution of serfdom in its most oppressive form. When Feodor died childless on January 7, 1598, Boris seized the throne. Patriarch Job of Moscow proposed his election, believing Boris to be the only man capable of coping with the difficulties of the time. Boris insisted that he would only accept the throne only from the Zemsky Sobor (national assembly) which met on February 17 and unanimously elected him on February 21. On September 1, he was coronated tsar. During the first years of his reign, he was both popular and prosperous, and ruled well. He recognized the need for Russia to catch up with the West intellectually and brought about educational and social reforms. He was the first tsar to import foreign teachers on a large scale, the first to send young Russians abroad to be educated, and the first to allow Lutheran churches to be built in Russia. After the Russo–Swedish War (1590–1595), he felt access to the Baltic Sea was necessary and attempted to obtain Livonia (modern-day Estonia) through diplomatic means. He cultivated friendly relations with the Scandinavians and hoped to take a bride from a foreign royal house, thereby increasing the dignity of his own dynasty. However he declined Polish-Lithuanian Commonwealth’s proposed personal union (combination of two or more states that have the same monarch while their boundaries, laws, and interests remain distinct) with him in 1600. Boris died after a lengthy illness and a stroke on April 23, 1605. He left one son, Feodor II, who succeeded him and ruled for only a few months, until he and Boris’ widow were murdered by the enemies of the Godunovs in Moscow on June 20, 1605. 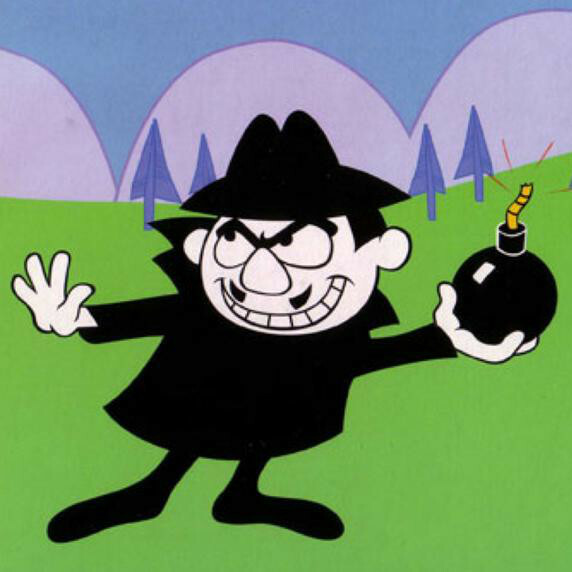 The Rocky and Bullwinkle Show’s Boris Badenov’s name is a play on Godunov’s name—“bad enough” instead of “good enough”.